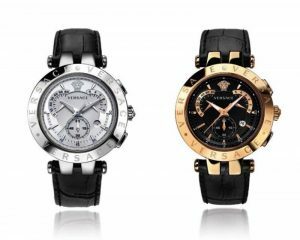 The Versace legacy of classic elegance extends to their collection of men’s watches for those with distinctive tastes. Featuring Swiss production standards coupled with the label’s singular design, the entire range of watches are crafted by an inspired team of engineers in Italy. The following watches are a few of the popular selections currently available from the Versace V-Race collection. Character, charisma, and charm form the backbone to this piece from the Versace label. This watch from the V-Race series features a stunning black leather band, stainless steel case, and a dual time display in an eye-catching black and gold finish. Designed for the power professional, it is water resistant up to 165 feet, and versatile enough for any occasion. With the brand’s iconic Medusa logo set at 12 o’clock, this stainless steel option from the Versace V-Race Collection features interchangeable topring, Swiss precision standards, and chronograph sundials. Water resistant up to 165 feet, this watch is crafted for the active stylish man on the go. This stunning entry in the Versace V-Race collection is a bold stainless steel watch with singular design and impressive features that include two interchangeable toprings (Greek key and Versace logo engraved), a Swiss Quartz chronograph, and water resistance up to 165 feet. This piece in the Versace V-Race series adds a touch of elegance that complements any formal menswear. Bio: Dev Randhawa is a men’s fashion blogger based out of New York. For more indispensible men’s fashion tips, follow Dev Randhawa.